By David Shear--On Wednesday, January 30th, 2013, one of the world’s most dynamic singer-songwriter instrumentalists, multiplatinum Israeli icon David Broza will be wowing a Toronto audience at a downtown location as United Jewish Appeal of Greater Toronto celebrates the success of its Annual Campaign 2013. Broza, a native of Haifa, has won the hearts of audiences with magnetic performances and soulful lyrics. 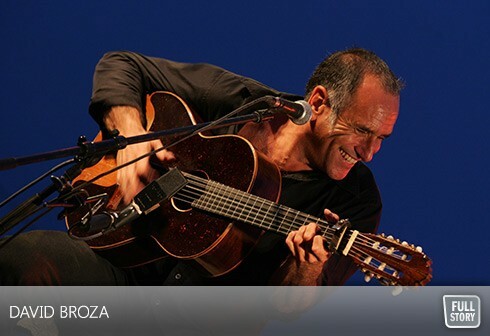 His virtuosic guitar playing fuses Israeli, Spanish, and English musical influences; his flamenco rhythms blend with intricate rock-and-roll finger picking. His enduring career has been defined by over twenty-five successful albums and numerous awards. The album Night Dawn: The Unpublished Poetry of Townes Van Zandt (2010) and Third Language (2011) have captured worldwide critical acclaim for fresh lyrics and expert instrumentals. Night Dawn sets Van Zandt’s poetry to original music by Broza, while Third Language was produced completely on the Internet - an unprecedented creative innovation in the music industry. A powerful musician, passionate peace advocate, and music industry innovator, Broza is sure to have participants up on their feet. RSVP: Brenda Cooper, bcooper@ujafed.org | 416.635.2883 x 5135, or register online.